We've wanted to write a post like this for a while. There's no shortage of activity guides for Hawaii, and while those are great sources of information, we want to share some places we love. You can trust us as your Hawaii wedding planners, and we think we know a thing or two about activities as well. These recommendations are our personal favorites. 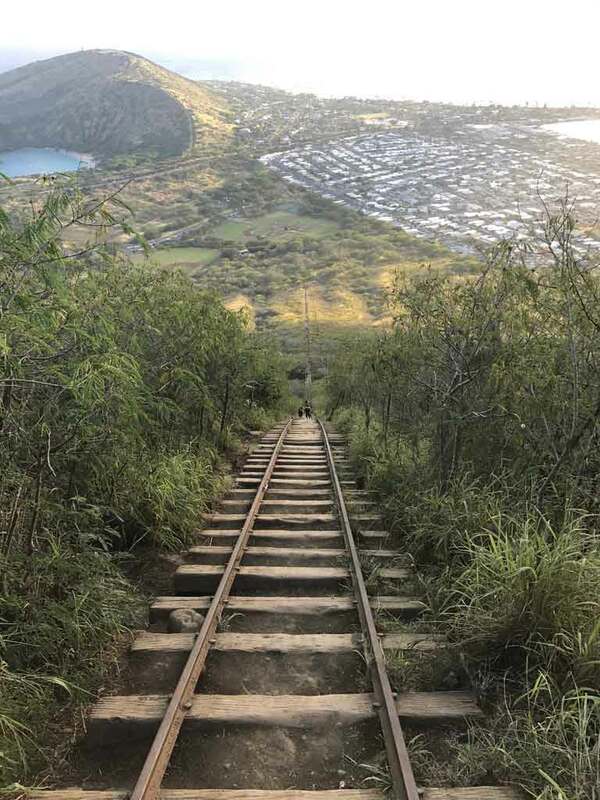 We included a few of the popular attractions that many of you've heard of, but we did our best to go off the beaten trail and focus on the lesser-knowns that we feel make Oahu so special. We broke our recommendations down into five categories: beaches, activies, hikes, Hawaiian foods, and shopping. 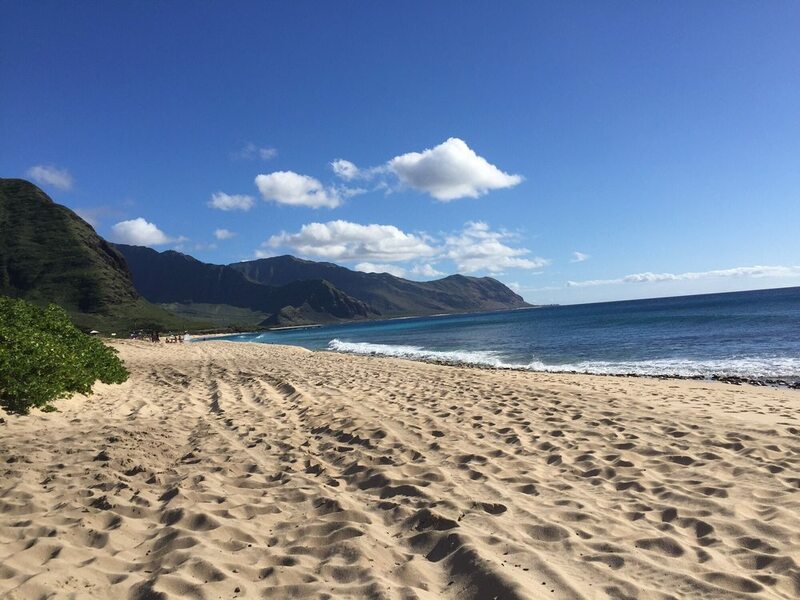 Oahu's beaches are a great place to start. Not only are they one of the top reasons people visit Hawaii, but they're also free! 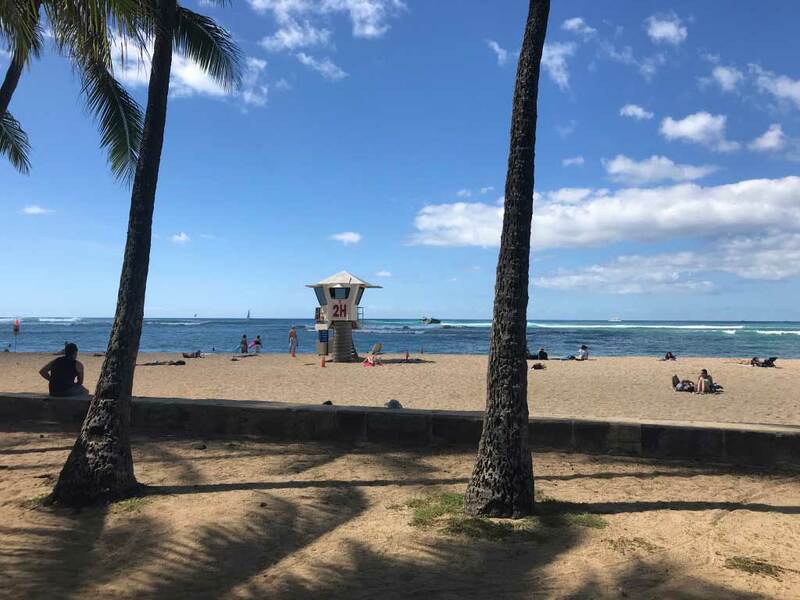 Most visitors to Waikiki might refer to everything from Diamond Head down to the Hilton Hawaiian Village as Waikiki Beach, but most sections of the beach have their own names. Kaimana Beach is a small stretch on the Diamond Head side of the Waikiki Aquarium just across from Kapiolani Park. It's a popular beach for locals, and although there are visitors there, it's less crowded than the beaches directly in front of the hotels. Although not a long stretch of beach, Kaimana is wide and there's usually plenty of space to relax. It's also a kid-friendly beach as it's not too deep and the current is usually not strong, but this is not always the case, so please be careful. It's a great beach in the Waikiki area, and it's a nice walk down from the Waikiki hotels. 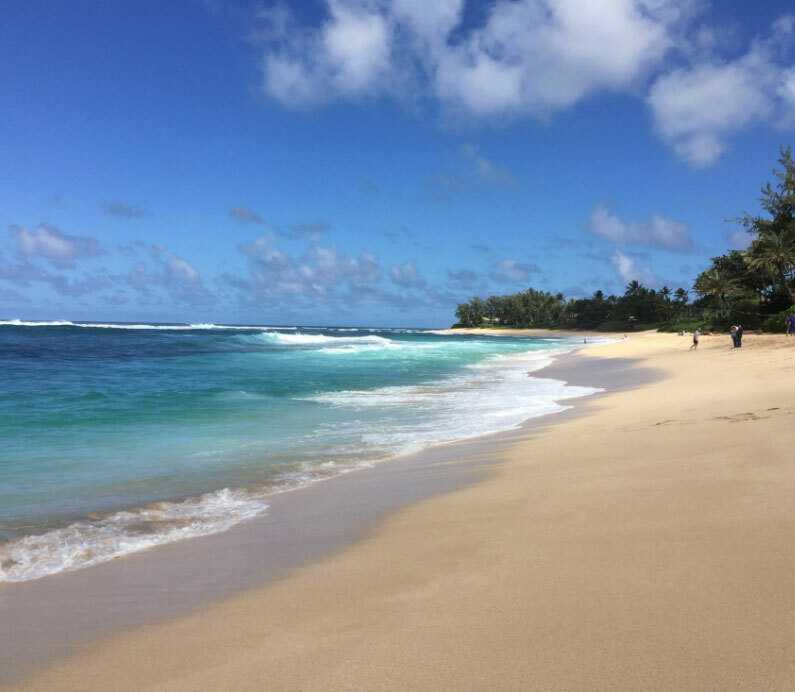 A little far from Waikiki but worth the trip, the North Shore has many beaches that could make our list. Lauren chose Sunset Beach because, as she put it, "it's beautiful, usually easy to park, has restrooms, good for swimming in the summer, and the beach isn't too crowded." And I agree -- Sunset Beach is a good recommendation! A day at the North Shore will likely include many stops to explore, and there are several other great beaches. If I had to choose just one, I'd recommend Sunset Beach, too. It may look crowded from the road, but there's a lot of beach. We thought it'd be good to point out that the waves in the winter months can be dangerously big on the North Shore. Great to watch, but it's not advised to swim during large surf. Here's another North Shore beach for you. 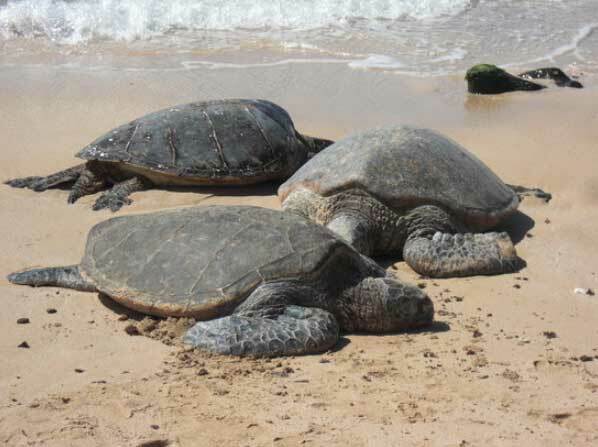 Laniakea isn't for swimming or lounging around, but rather it's for seeing sea turtles. Not that you can't swim or lounge around, but most people just stop hoping to see the turtles. If you're lucky, there'll be a few right up on the sand. Turtles...just taking it easy on the beach. Laniakea gets crowded, and parking is tight, but for kids or animal lovers, it's a real treat. Note: It is illegal to feed or touch the sea turtles, and it's frowned upon to get too close. A distance of 10+ feet is recommended. Disturbing a turtle could result in a federal or state violation. You can read more on the State of Hawaii's Division of Aquatic Resources page. Sherwood's is not only our number one location for a beach ceremony, but it's also one of the best spots for an amazing beach day. If you see Rachel at a beach, there's about a 90% chance this is where you'll find her (the other 10% of the time she's at Waimea Bay on the North Shore). Sherwood's is a very long stretch of beach with lots of space and seclusion, but if you go on a weekend or holiday, the parking lot can fill up. During the week, you might be surprised there aren't more people here. The wide, long beach, the turquoise water, the lush mountains in the background, the smaller crowds than many of Oahu's beaches ... yeah, I'm with Rachel. Sherwood's is a local favorite. Located all the way over on Oahu's West Side, Yokohama Bay is literally the end of the road. Few visitors make it up this far, and considering the distance from Waikiki, I can understand why. However, if you want a very uncrowded beach and have the time, it's a beautiful part of the island. The early crowd at Yokohama Bay. Yes, it's beautiful, but there are some drawbacks. It's far and petty theft is more common here, so don't leave valuables unattended or visible in your locked car. If you have the time and want to see all Oahu has to offer, I think it's worth the drive, especially if you swing by Pearl Harbor on the way. Also, on those extremely rare days when Honolulu is covered in clouds, there's a good chance Yokohama Bay is sunny. Check that weather radar. The West Side gets less rain than the rest of the island, and I like to believe there's always sun somewhere on Oahu. We teamed up on this to choose a few of our favorite activities. We all agreed that a massage and sunset cruise should make the list, and the Sea Spa combines both activities into one experience. You start with a spa treatment before heading out for a sunset cruise with champagne and pupus. Massage areas are private, and the sunset cruise gives you beautiful views of Waikiki and Diamond Head. If you're looking to pamper yourself, this would be a great option. There's a maximum of six guests per cruise, so it's perfect for a small bachelorette party or maybe a way for the two of you to relax after your big day. Full disclaimer: We haven't tried Sea Spa yet, but the reviews are good, and we know a cruise out in front of Waikiki is beautiful. We're going to test them out soon, so if you this looks like something you're interested in, ask us how we liked it. We should have an answer for your shortly. For the adventurous type, Island Water Sports offers what you'd expect. Yes, they have cruises, snorkeling trips, stand-up paddle boards, and surfing, but they also have something most people haven't seen before: submarine scooters! They also have a video on their Facebook page with an octopus stuck on the front of the helmet! None of us have tried the scooters, but they sure look fun. They're located in Hawaii Kai, not too far from Kona Brewing Company if you're looking for a place to eat afterward. For the ultimate island tour, go by air. You can choose short trips around selected parts of Oahu, or you can go big and do the whole island. Either way, it's a memory you'll have for life. Two companies with good reputations are Blue Hawaiian and Makani Kai. They both have videos and route information on their websites. Lanikai is one of Oahu's most famous beaches. 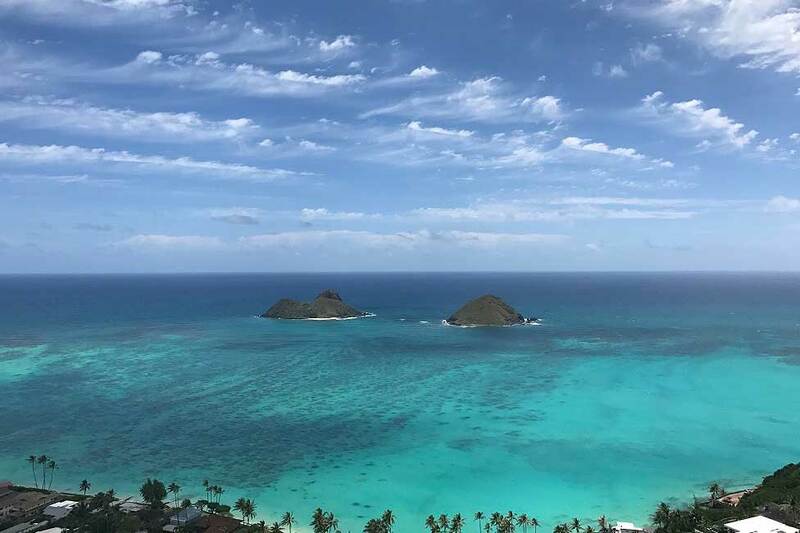 The Pillbox Trail overlooks the Lanikai and the two Mokulua Islands. The hike itself isn't too difficult, but it is steep and a little slippery with loose gravel in the beginning. I took this photo, and I can tell you, the color was better in real life. There are three pillboxes dating back to World War II. Most hikers only go to the first or second one, take some pictures, and then head back down. It is possible, however, to continue on the path. If you do, you'll come out at the other end of Lanikai and have to walk back to your car through the neighborhood. As long as you don't slip on the way up, it's not too difficult of a hike ... and that view! This one is definitely off the tourist trail. 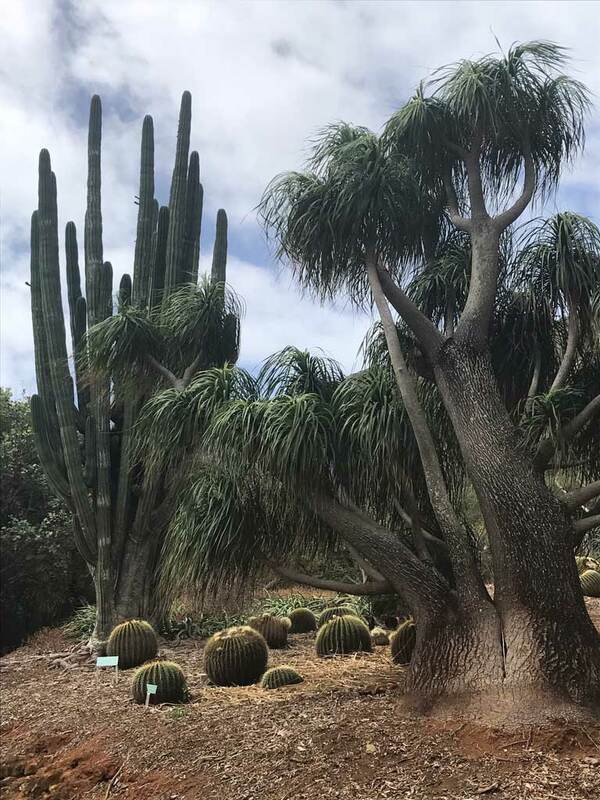 Koko Head Botanical Garden is a flat walk that leads through multiple gardens. There are plants back there that look like they're from another planet. Very cool! I think Dr. Seuss designed this tree. At about two miles round trip, it's just long enough to feel like you've gotten some exercise. And if you go early or later in the day, it's not too hot. Makapu'u Point Lighthouse Trail is a popular and fairly easy hike. The path to the top is paved, and there are several lookout spots along the way. 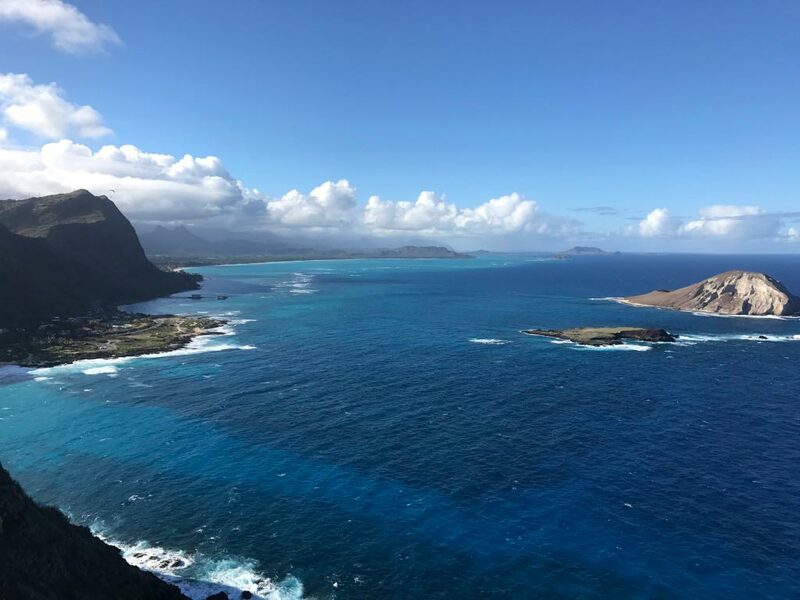 In the winter, this is a good spot to see whales, and on clear days, you can see Moloka'i, Lana'i, and maybe even Maui. From the top, you can see the Waimanalo coastline, which we all agree is one of the best views on the island. Such an amazing view from Makapu'u Lighthouse. 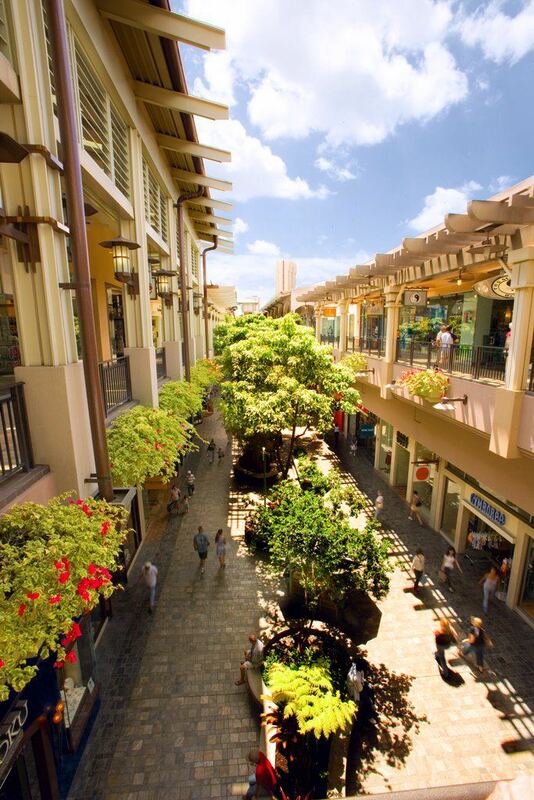 Rachel's Pick: Does Ala Moana Shopping Center Count? Yes, Rachel. Yes, it does lol! The stairs are railroad ties from WWII. If you do try Koko Stairs, be sure to take water and be careful. The steps are uneven, and it's easy to turn an ankle. Unless you're looking for a workout, there are probably better options for a hike. We teamed up on this one, mainly because there was a lot of agreement. 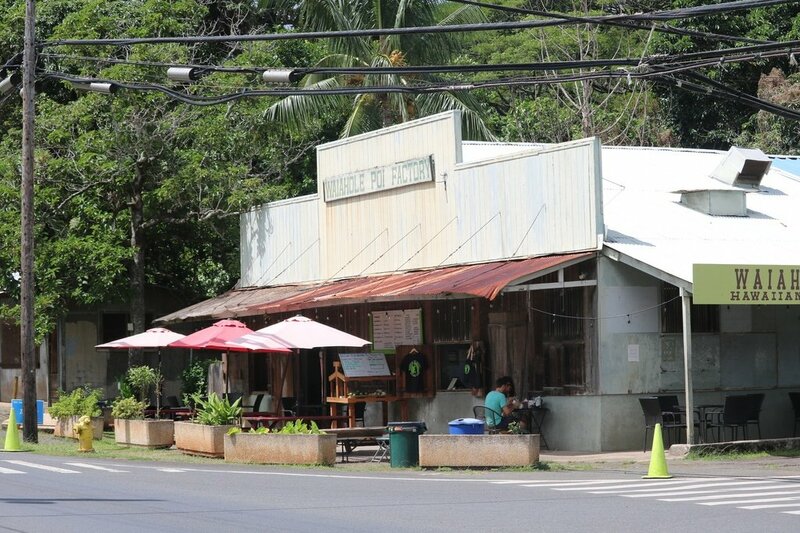 If you drive to the North Shore, we recommend heading across the Pali Highway or the Likelike Highway and driving up the coast. 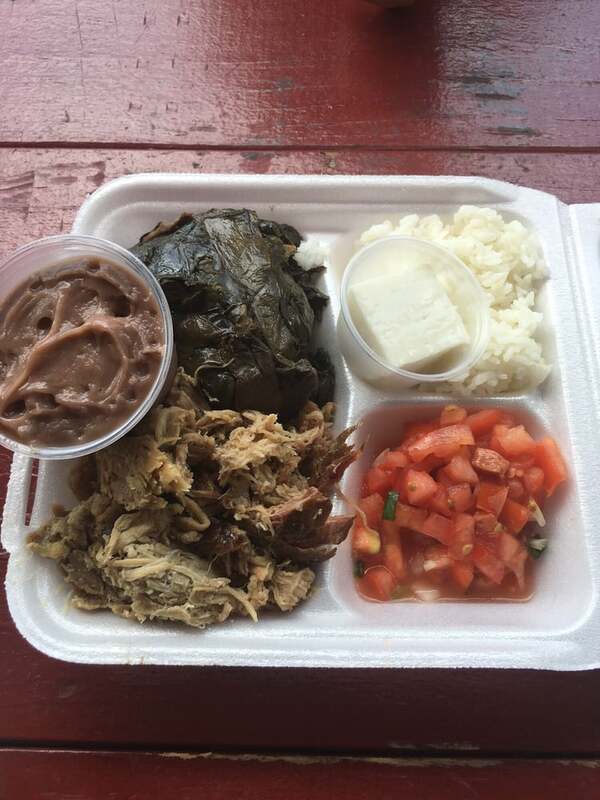 It's faster to cut through the middle of the island, but this drive is beautiful, and you can stop at the Waiahole Poi Factory for a plate lunch of laulau (chicken, pork, squid, or beef steamed in taro leaves) and kalua pig. Plate lunch of laulau, kalua pig, poi, lomilomi salmon, rice, and haupia. Our choice if you want Hawaiian food in Honolulu is the Highway Inn. You can try the same food as at the Poi Factory, but the Highway Inn is a short drive from Waikiki. The restaurant is casual, and the food is served on cafeteria-style trays, but it's still a nice place for lunch or dinner. The restaurant is located at the SALT complex outside of Waikiki. There are also several other restaurants, cafes, a craft beer bar, and other businesses, so you might want to hang out a while. Spam is huge in Hawaii, and although Lauren won't eat it, the rest of us like it. Regular musubi is spam cooked in shoyu (soy sauce) on a block of rice wrapped with seaweed, but there are several other kinds. 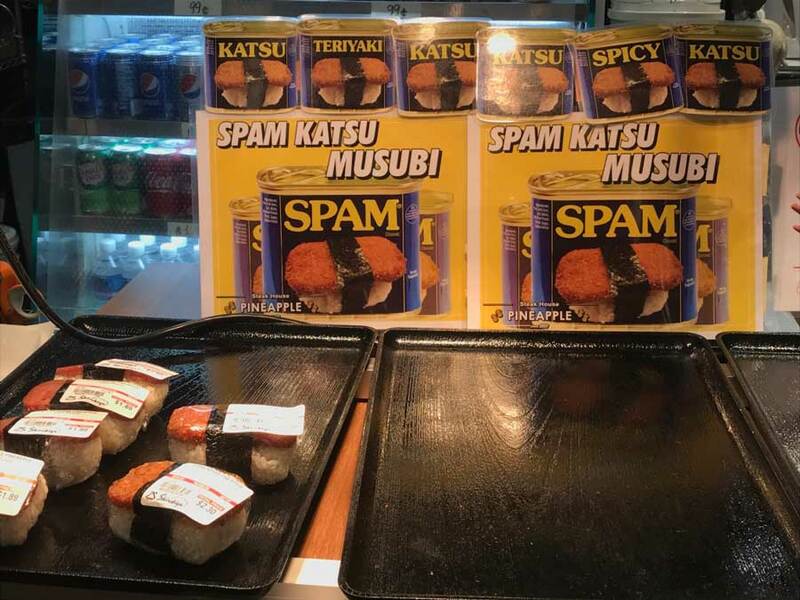 My favorite is Spam, egg, avocado, and bacon musubi. Yum! Shave ice is a popular local treat. 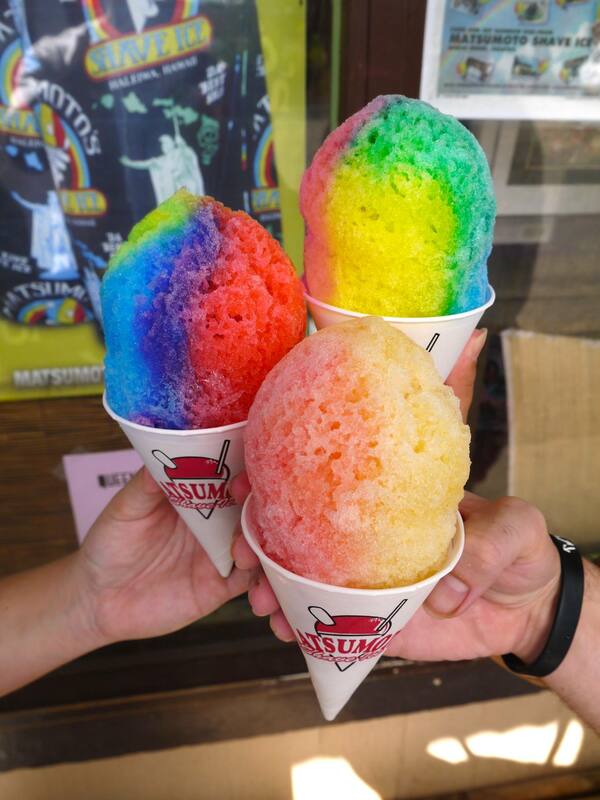 It's Hawaii's version of the snow cone. Matsumoto Shave Ice on the North Shore and Waiola Shave Ice in Honolulu are the two most famous places, and you'll see lots of little shops selling it throughout the island. Trust me -- that's no snow cone. Yes, it's more than just a place for Rachel to hike. Ala Moana Center is the largest open-air shopping center in the world, and if you do spend an afternoon walking around it, you'll sure feel like you've gotten some exercise. There are over 340 stores and restaurants and over two million square feet of retail space! If you want to try all kinds of local foods, head to the north end and look for Shirokiya Japan Village. Not only do they have around 50 different food stalls to choose from, but they also have the cheapest beer on the island. You can try a Primo (Hawaiian beer) for $1. That's crazy cheap. Shirokiya's atmosphere is super casual, making it a fun spot for a shopping break. There are so many shops and shopping centers scattered through Waikiki that we don't think you'll have trouble finding things to buy. You can buy souvenirs and basic supplies at the ABC Stores, there are individual name-brand stores all over, and you can even buy a Tesla right on Kalakaua Avenue. Okay, so these aren't exactly off the beaten trail, but between Ala Moana Center and Waikiki, you've got just about everything you could want to buy. We had a lot of fun coming up with ideas for this blog post. If I had more time, I could easily write another couple thousand words, but I'm going to leave it here. Maybe we'll put together more recommendations soon. We have so many ideas to share. 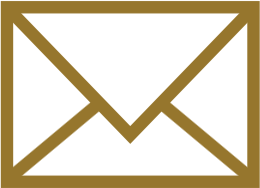 If you ever have questions or need suggestions on what to do while in Hawaii, you can reach out to any of us. We know the island well and are always happy to help.